I decided to follow up my recent experiments in monochrome, first building the drawings at 100% opacity, then fading the images gradually and releasing the stills to my memory stick. This time I got Dima to help me with the video editing process and I also added a soundtrack. A kind of faded quality also can be achieved using the transparency slider (the little characteristic overlap marks where the pen curves or draws over existing lines are one of the most intriguing features of Tagtool drawing) but I particularly like the quality of the faded images as the edges of the lines become softened and blurred and also, last but not least, the ability to reorder the stills to make the drawings magically reappear. 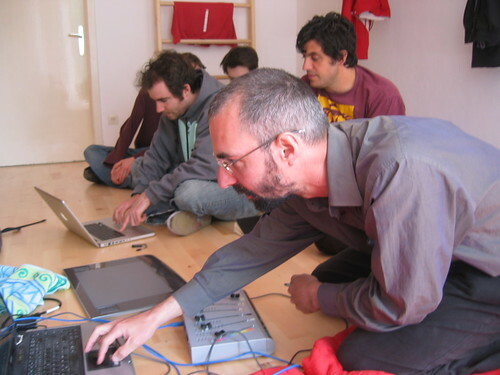 The text I made by speaking a few statements into a granular synthesizer – a first experiment using my own voice and text! I used the release buttons on the gamepad to copy a selection of photos from the computer on to my memory stick while I was drawing on my own in the studio. I intended to have these photos only as a record of my drawing session but when I viewed them on the computer I decided to make them into a video using Picasa. 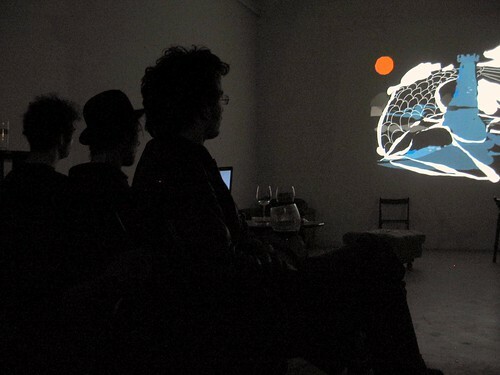 As I promised in my last posting about the Tagtool Think Tank weekend, here is the video that we showed at this event. 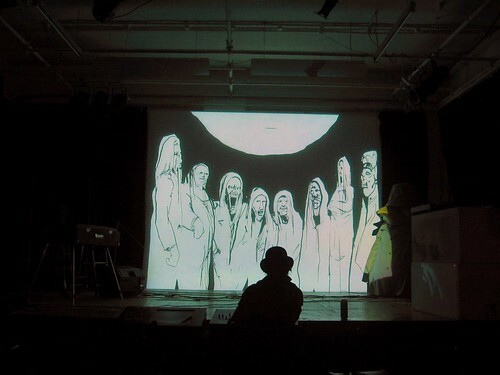 It consists of three complete unedited drawing sessions, each one having a different video clip from our own 16mm film footage as background. Dima’s guitar accompaniment was recorded in one straight ‘take’. In other words, both the drawing and music appear wth none of the hesitations and mistakes edited out. I have posted it exactly as we showed it. 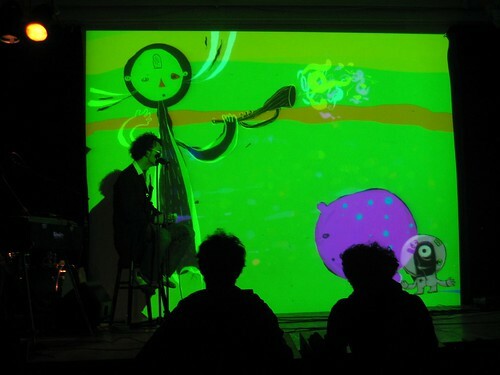 OMA International, the developers of the Tagtool project, hosted this event last weekend in Tulln, Austria bringing together together coders, artists and enthusiasts who have an interest in or use the Tagtool in their work. 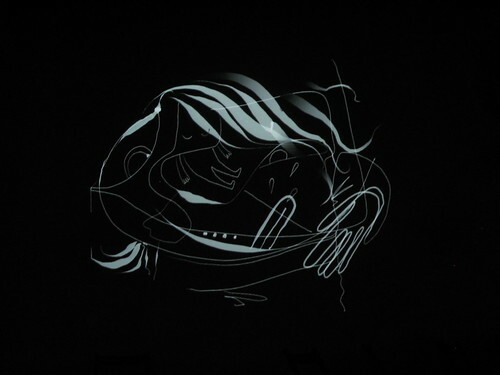 The documentation that can be found on the Tagtool website www.tagtool.org includes full video coverage of the main speakers at this event – I recommend this as very interesting viewing if you haven’t already visited the site. As usual, this blog will concentrate on the visual rather than the technical as I have only the very vaguest notion of programming and developer matters. But I thought it was a specially nice touch to have live Tagtool artist annotations to highlight the various speakers’ on-screen visuals. Here are a couple of examples from Joreg Diessl of VVVV Group’s presentation. 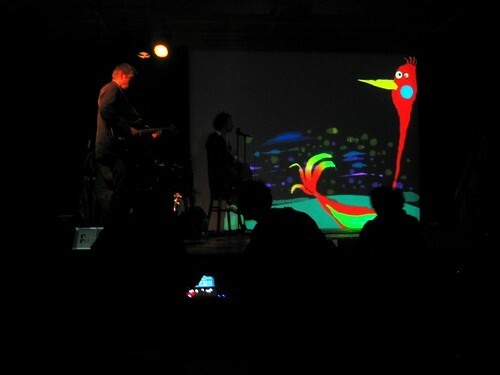 Although we took our laptops, Tagtool and mixer with us, as our contribution to the Open Mic session on Friday evening we showed only a short video clip of our latest Tagtool session. I will put it on the blog as a separate entry later but it was very encouraging that it seemed to be well received by the audience. 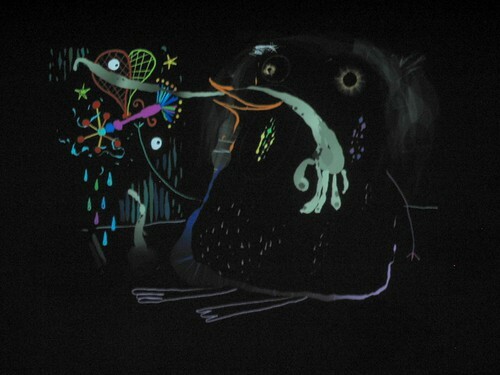 For me, the most interesting thing about this session was to see the extremely wide variety of applications in which the Tagtool had been used, and the lively discussion afterwards provided an opportunity for us to get to know each other and compare our Tagtool experiences. With its large stage, three projectors and two separate screening areas the Kunstwerkstatt Tulln was the ideal venue for this event. 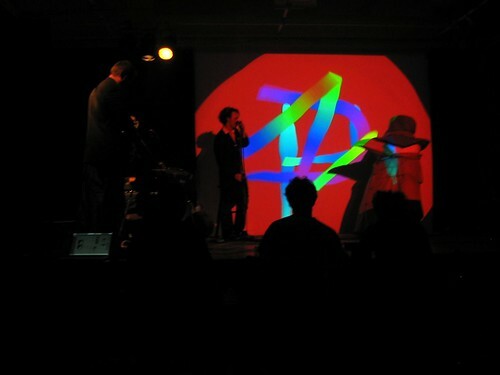 As the Hilti webisodes on Vimeo provided one of my earliest encounters with the Tagtool Project I was very eagerly anticipating the Saturday evening, ‘Odyssey of Oddities’ live performance. I was not disappointed! 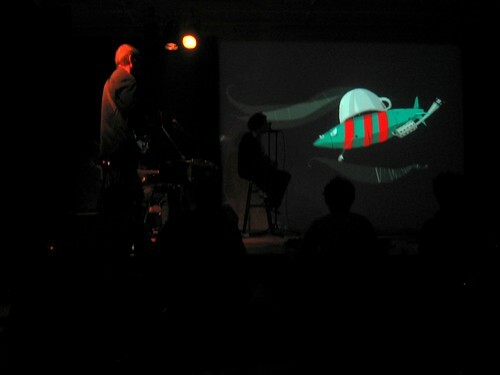 A large and appreciative local audience who had obviously enjoyed the adventures of the space mechanic and his spacecraft before, joined us for this performance. 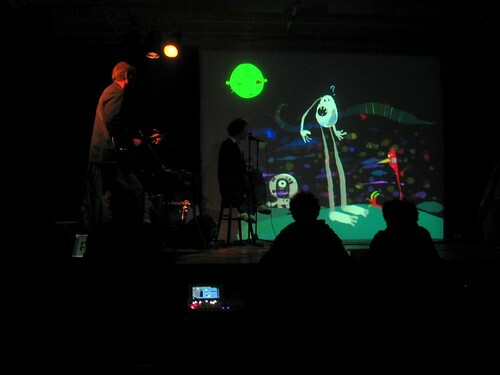 The show consisted of two improvised sets with the artists, animators, musicians and narrator all working together to create the most engaging, charming – and deceptively effortless-looking performance – imaginable. I took lots and lots of photos. It is really difficult to make a selection that will convey the superb quality of this performance, but here are just a few images. 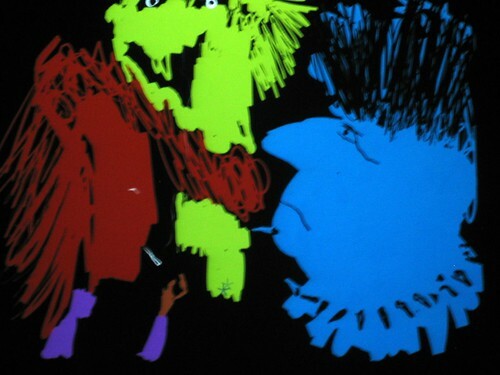 I do hope that a video will appear on Vimeo soon and we will all be able to enjoy the music and narration once again. 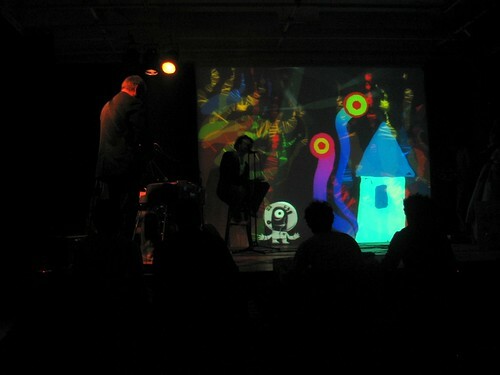 Hilti’s ‘Odyssey of Oddities’ showed just how magical an instrument the Tagtool can be in a live performance. 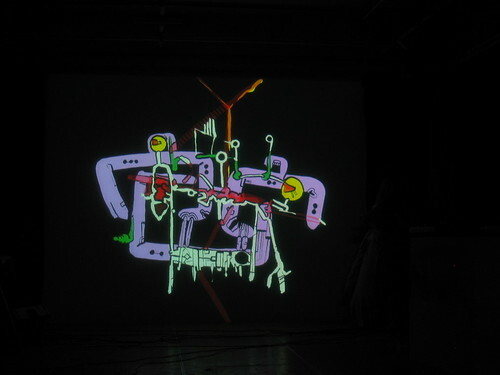 More informal discussions and an opportunity to play with the latest version of the Tagtool followed Sunday brunch and in the evening we went back to the Kunstwerkstatt, set up our laptops and Tagtools and had a fun evening of drawing until very late. 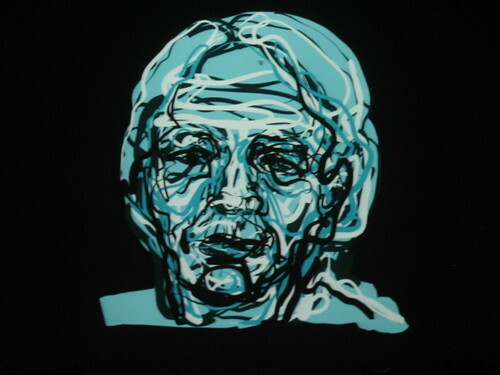 But as well as being great fun, this evening was also really illuminating as, with everyone taking turns to draw, it was possible to see most clearly just how powerful and versatile the Tagtool is. I think this selection of stills from our evening of fun shows both the variety and scope of visual expression that can be achieved – all very different and all very personal!